Antonio Cuneo came to New York City from Soglio, Liguria in northwestern Italy in 1855. The 20-year old was, according to The Sun years later, “absolutely penniless.” With startling business acumen, he grew his grocery shop on Baxter Street into the basis of a fortune. Little by little he poured his profits into cheap real estate, mostly in the Mulberry Bend neighborhood. Once a respectable, middle class area, by the end of the Civil War it was rife with disease, crime and squalor. Mulberry Bend is considered by many urban historians to be America’s first slum. And Antonio Cuneo was one of the country’s first slumlords. While he gained prominence as “The Banana King” by controlling nearly all the importation of bananas into the United States, his tenement houses were among the worst in the city. In April 1885 he found himself in Police Court for not providing fire escapes on his buildings. Ordered to pay a $250 fine for each violation or go to prison for six months, he paid the fines. The tenants continued to live without fire escapes. The intense lobbying of reformer Jacob Riis eventually prompted the city to take action regarding Mulberry Bend. The city purchased 130 structures, ranging from dilapidated shacks to tenement houses, and began demolition for a park. For his six tenement buildings on the park site, Cuneo received over $200,000—around $5.25 million today. The wealthy grocer/real estate man had already added “banker” to his resume with his Banca Italia. He would use some of these proceeds to erect a new bank building. The building, completed in 1888, was indeed large--five stories tall and wrapping the corner to encompass No. 101 Park Street--but was more tenement building than bank. Generally Italian Renaissance in style, the brick façade was decorated with terra cotta panels and capped with a pressed metal cornice. Cuneo’s Banca Italia took up the first floor while upstairs, accessed at No. 101 Park Street (later renamed Mosco Street), were apartments. The shrewd businessman must have sensed that the park and other improvements would upgrade the seedy neighborhood; for the apartments in his new building were adequate enough that he and his wife moved into No. 101 Park Street. Owning a bank and an apartment house did not mean that Antonio Cuneo reformed. In June 1892 he provided bail for his brother, Nicolo, who was arrested on Pier 3 while supervising the unloading of bananas. A customs officer charged him with making “a false statement under oath as to the actual value of twenty-two cases of dried mushrooms,” said The New York Times on June 22. Two years later the newspaper took Cuneo to task for his continued slum lord practices. “One of the worst tenements, if not the very worst, in the city is Banker A Cuneo’s Calabrian hovel in ‘the Bend’ at 65 Mulberry Street. Cuneo, who has a pretentious financial establishment at 28 Mulberry Street, bought the place as a speculation ten years ago.” The tenement consisted of a front and rear building and the newspaper was scathing in its description. It was about this time that Cuneo, for some reason, added an impressive doorway to his Banca Italia. 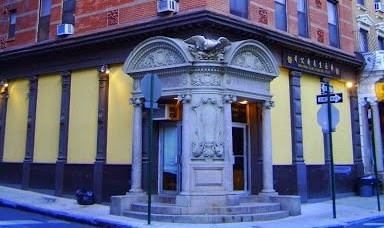 With doorways on both Park Street and Mulberry, it was like a temple entrance. The heavily carved stone entrance, capped with dramatic arched pediments and an superb eagle poised to take flight, announced to the Italian immigrant neighborhood that this was a solid financial institution. A handsome park and a bank were not enough, of course, to totally turn the neighborhood around. Among the residents of No. 28 Mulberry Street in 1903 was Antonio Santini. Chief Agent Flynn of the United States Secret Service and his assistants had been closely watching Santini for some time and finally on July 17, 1903 they arrested him along with other members of his counterfeiting ring. In the raid Santini tried to hide evidence, but The Sun reported “Policeman Dean of the Fulton street station arrived soon afterward and handed over the roll of bills that Santini had thrown away. It contained ten five-dollar counterfeits.” Chief Agent Flynn was unimpressed with Santini’s art. Although the apartments at No. 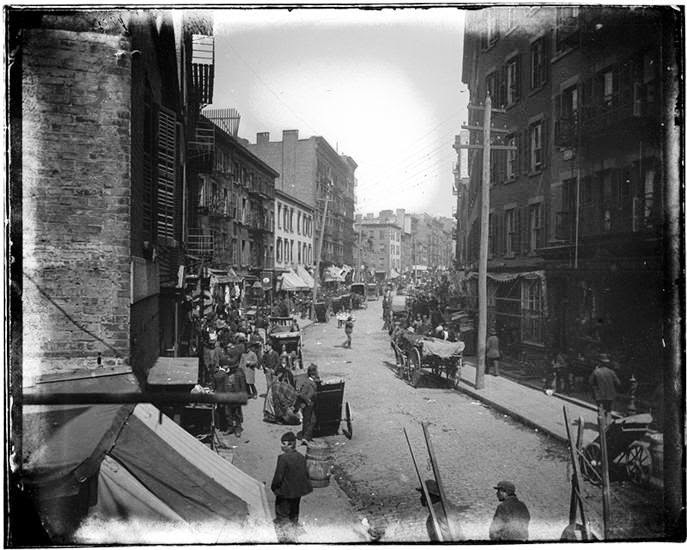 Mulberry Street appear to have been better than most in the neighborhood; conditions for the immigrant families at the turn of the century were still harsh. In the days before air conditioning or electric fans tenement dwellers suffered in the intense head of city summers. The same year that Santini was arrested the Apantoni family lived here. The summer of 1903 saw a brutal heat wave. It was such that little 4-year old Giecoma Apantoni was overcome with the heat in the apartment and later died in St. Vincent’s Hospital. In the meantime, Angelo Cuneo had taken over the operation of Banca Italia. The first decade of the 20th century was marked by anarchists groups who terrorized businessmen and politicians with bombings of businesses and threats against the capitalists' lives. One of the most infamous was the Italian-based Black Hand. In 1905 they turned their attentions to Angelo Cuneo. Angelo Cuneo had no intentions of being bullied by terrorists and turned the letter over to police. A sting operation ensued in which a single dollar bill was put in an envelope and delivered to the letter box as ordered. Soon one of the extortionists took the bait. When he opened the envelope and found the dollar bill, he threw it to the floor in disgust. Detectives followed him as he rushed off to meet his accomplice and their arrests followed. It appears that by 1914 Angelo Cuneo had anglicized his name to Andrew. In February that year he went to New Orleans on business and in his absence panic set in among his Italian depositors. Rumors spread through the neighborhood that he had left for Europe, abandoning the bank. A run on the bank ensued. The depositors apparently had good reason to be nervous, however. Before the end of the year Cuneo would declare bankruptcy, owing his depositors $200,000. Andrew Cuneo’s wife, Joan Newton Cuneo, was no stay-at-home housewife. While Cuneo had been squelching the run on his bank, she was in Europe “for a rest and to look over some new automobile models,” according to The Sun. Joan Cuneo was not looking for touring cars or coupes. She was a race car driver, earning her a reputation as well-known as her husband’s. In 1911 she had won the Long Island automobile races. But Joan’s occupation and resultant absences may caused her husband’s eye to wander. In the summer of 1915 Andrew Cuneo was sued for $50,000 in a breach of promise suit. Actress and artists’ model Yvette de Von swore in affidavits that he promised to marry her and she had no idea he was already married. Cuneo responded by suing her for perjury. Cuneo did not attempt to deny the affair which had gone on for at least four years. But his witnesses explained to the judge that it was impossible that she was unaware of Joan Newton Cuneo. In 1923 a new bank would open here. In 1914 Guiseppe Termini established himself as a “private banker.” Now, having changed his name to Joseph, he organized the Old Colony State Bank. Termini’s bank would not last long here, however; and by 1929 it was a branch of the Bank of America. That year 24-year old teller William L. Reda thought no one would notice if he pocketed depositors’ cash. The missing $21,000 was noticed and Reda went to jail. The days of banking at No. 28 Mulberry were coming to an end. By the time of the Great Depression the neighborhood was as much Chinese as Italian. In 1934 the ground floor space was converted to the Kimlau Mortuary, operated by Benjamin Kimlau. The Kimlau family lived upstairs. When World War II erupted an estimated 4,000 Chinese-American men from the New York area went off to fight in the war. Among them was 26-year old Benjamin Ralph Kimlau. A member of the Army Air Forces, he became the first Chinese pilot of a heavy bomber. During his 46th bombing mission from a New Guinea base, his B24 was hit by heaving gunfire. Both Kimlau and his co-pilot were wounded. He managed to bring the plane back to base where he crash-landed. The hero pilot died three hours later. Back home, part of Chatham Square would be named in his honor as was the first Chinese American Legion Post. Today Antonio Cuneo’s former banking floor is still occupied by a Chinese funeral home. Other than replacement windows and the closing up of the ground floor openings, little has changed to the building that marked a remarkable change in Mulberry Bend—including Cuneo’s remarkable and dramatic corner entrance. 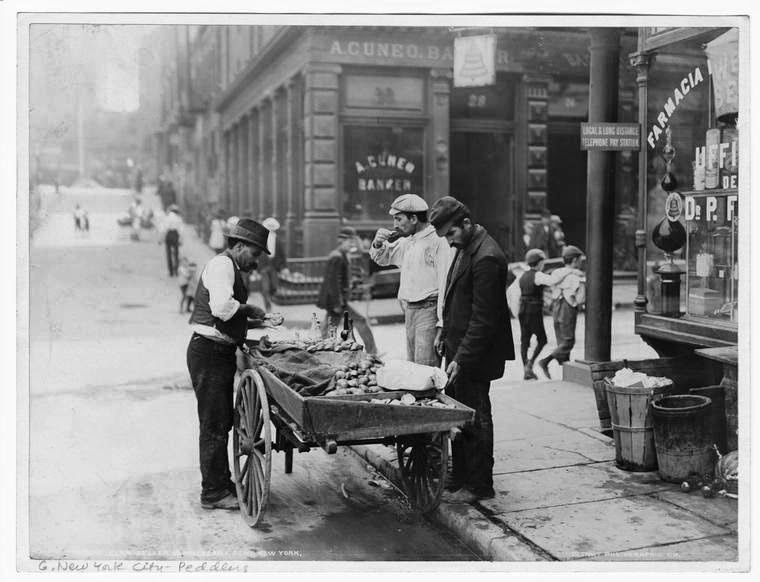 This article presents the history of Mosco Street and its namesake, mentioning the Banca Italia at the corner of Mosco and Mulberry Streets.